Perhaps Hollywood’s most famous sibling rivalry was the supposed one between the two sisters Olivia de Havilland and Joan Fontaine, which became the stuff for the media for decades. 15 months separated in age, the sisters pursued the same career choice, competed for the same Oscar category, even attained some of the same love interests. However, it was these similarities that further inflamed their feud from childhood to a lifetime. As children, the sisters didn’t get along. In her 1978 autobiography No Bed of Roses, Joan indicated that part of their problems came from Olivia’s resentment at having to share the attention with a younger sibling. As they lived in the same room, their collisions frequently happened, from when Joan was still in the crib to their teenage years. The supposed bullying started with Olivia’s picking on Joan, then escalated to hair-pulling, clothes-tearing and even downright fighting, with an incident caused by Olivia that led to Joan’s collarbone fractured. Afterwards, the mistreatment turned more mental, with Olivia reportedly publishing a fake will that read “I bequeath to my sister the ability to win boy’s hearts, which she does not have at present,” as she was the editor of their high school newspaper. 1940s. 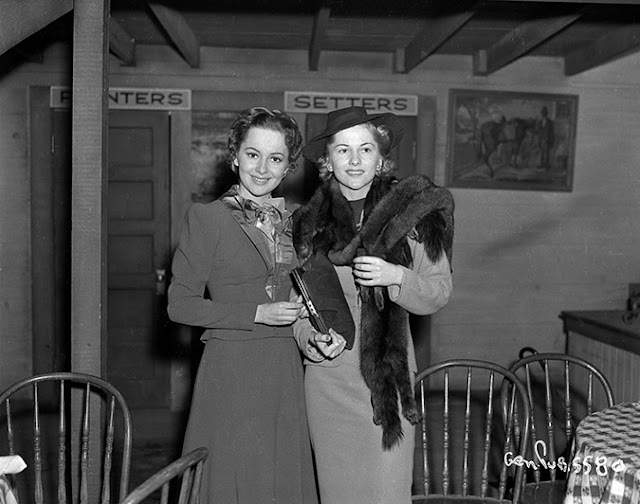 Joan Fontaine and Olivia de Havilland smiling at one another while attending an event at the Hollywood Canteen, Los Angeles, California. 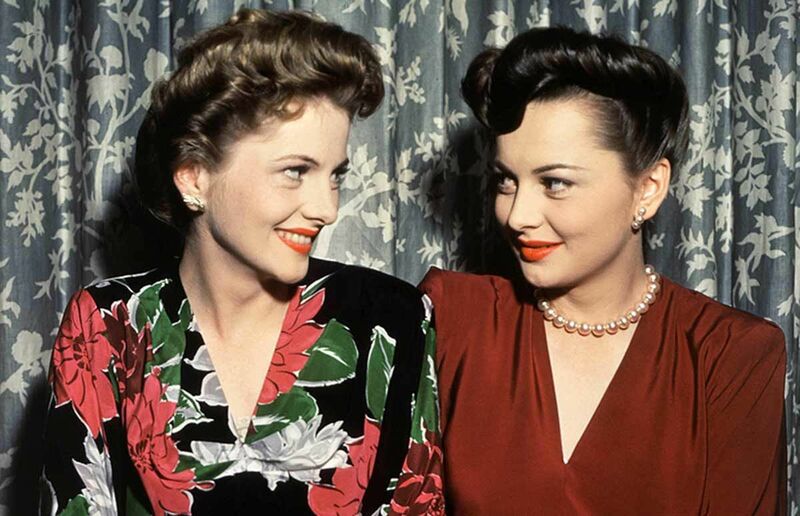 Their feud reached new heights at the events of the 1939 classic Gone With the Wind, when Joan recalled that she was turned down for the role Melanie for being “too stylish,” then generously suggested her sister to George Cukor. Olivia earned her first Oscar nomination for the part and made no mention of this. 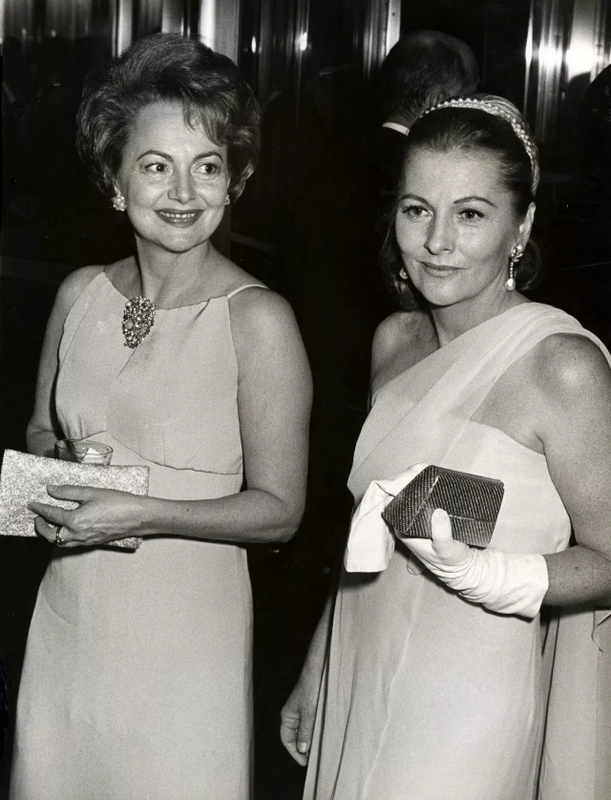 The year after Gone With the Wind won the Best Picture Oscar, the statuette went to Rebecca, and Joan was nominated for Best Actress for the first time. 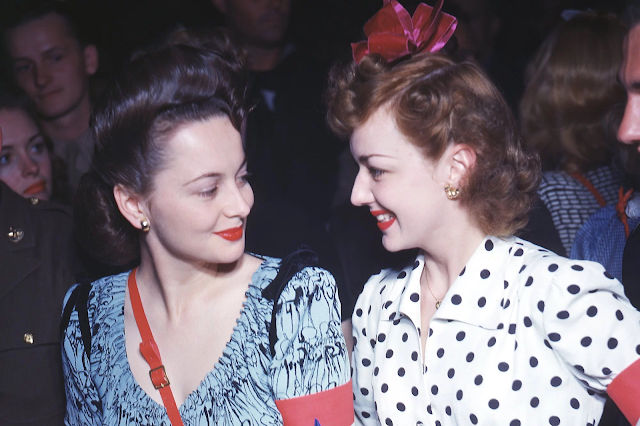 Their climactic showdown of a lifetime was brought out for the whole Hollywood to see in 1942, when Olivia and Joan were both nominated for Best Actress at the 14th Academy Awards, making them the first pair of siblings to compete for the same Oscar category. When the announcement of Joan’s winning for Suspicion was made, the attendees found themselves surprised at the scene of Olivia seizing Joan’s hand and crowing, “We’ve got it!”, for they had hopefully expected that the losing sister would fly into rage or burst into tears. 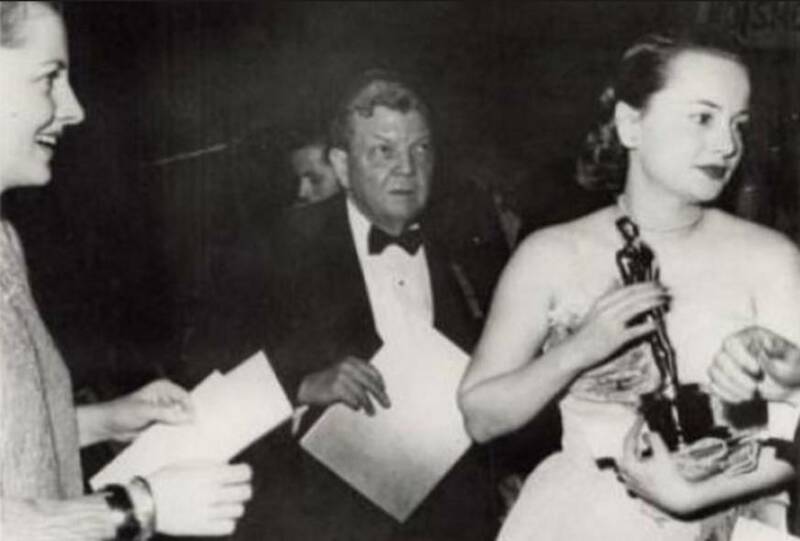 Olivia’s night of triumph came in 1947, as she won the Best Actress Oscar for To Each His Own. However, when Joan advanced towards her sister to congratulate, Olivia shied away from her, leaving the other sister with a bewildered expression. 1947. 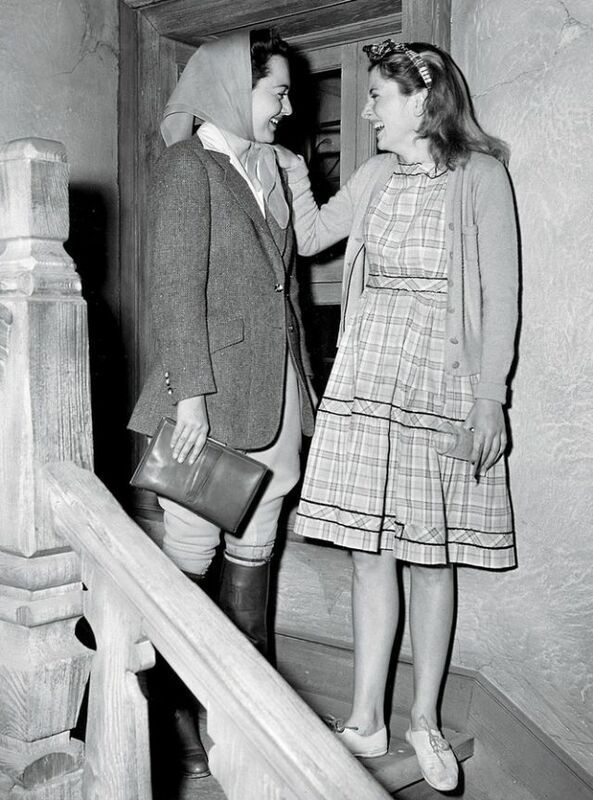 Olivia de Havilland turning away from sister Joan Fontaine. Photo by Hymie Fink of Photoplay. 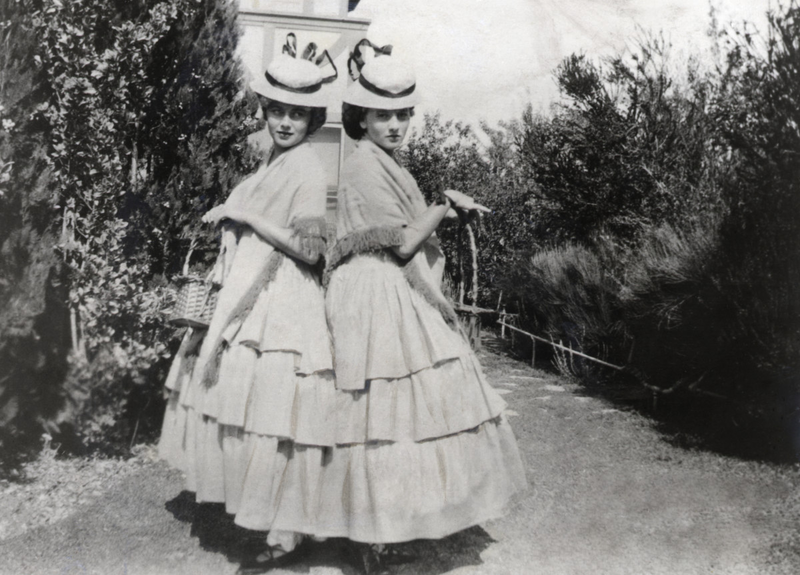 The nature of the talented sisters’ relationship has been reported for decades by the media that it has become firmly established in Hollywood legends. 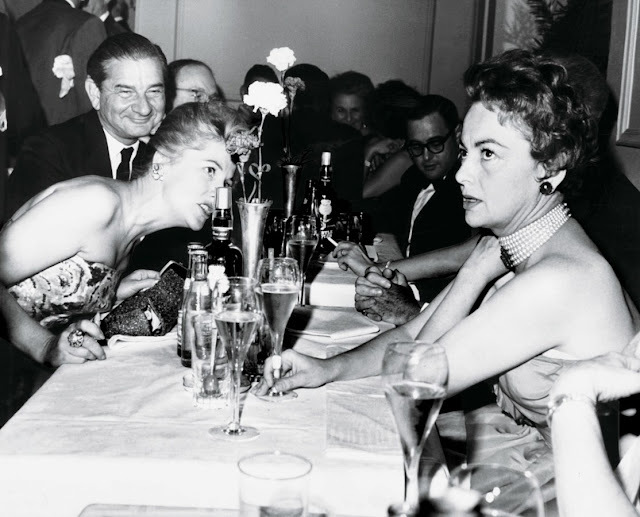 However, when Scott Feinberg from The Hollywood Reporter interviewed both of them, Joan furiously denied the rivalry. “This ‘Olivia feud’ has always irritated me because it has no basis. To this day it has no basis!” She told him. “Olivia and I have never had a quarrel. We have never had any dissatisfaction. We have never had hard words.” Whether their feud was fact, fiction or something in between, people who were not in charges will never know for sure. 1934. 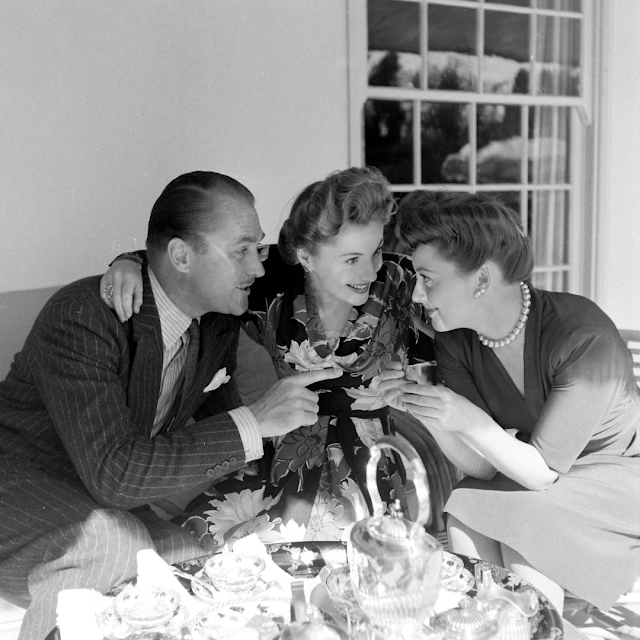 Sisters Olivia de Havilland (left) and Joan Fontaine at a party in Saratoga, California. 1939, January 13. Olivia de Havilland and her sister, Joan Fontaine attending a party at Warner Bros. Studios in Burbank, California. 1940s. 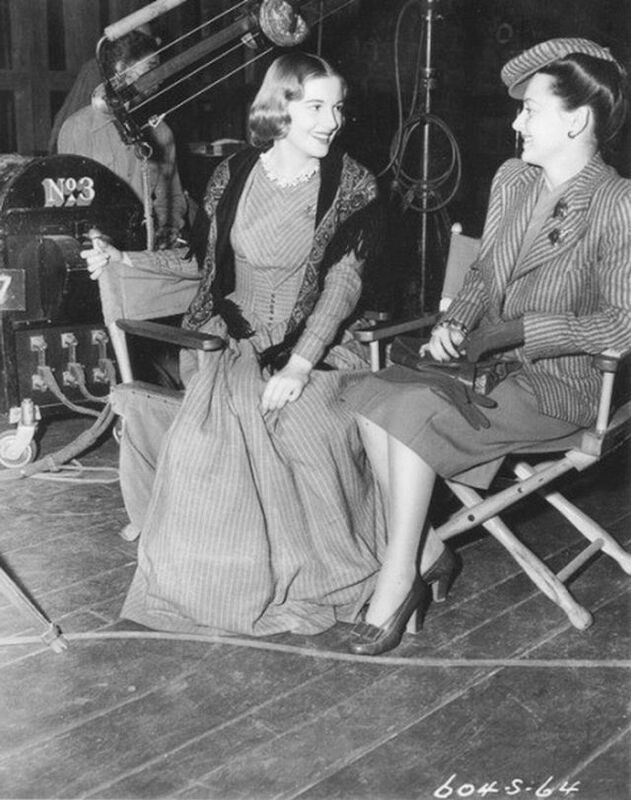 Sisters Olivia de Havilland and Joan Fontaine smiling at one another. 1940s. 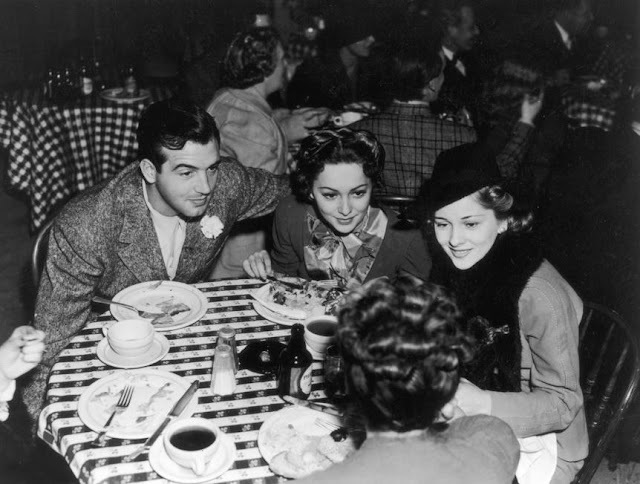 Olivia de Havilland leaning in to hear a conversation while lunching with her sister Joan Fontaine and actor John Payne. 1940s. 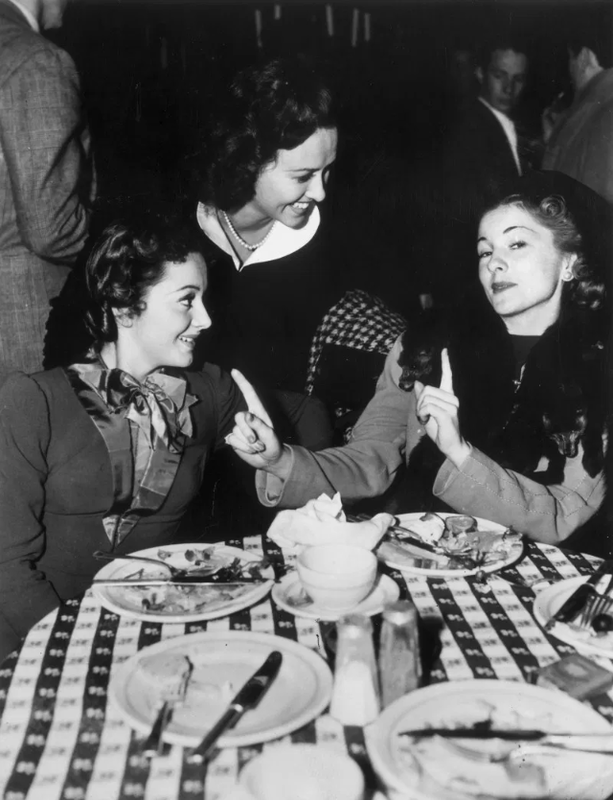 Olivia de Havilland in a restaurant with her sister Joan Fontaine (right) and actress Margaret Lindsay. 1942. 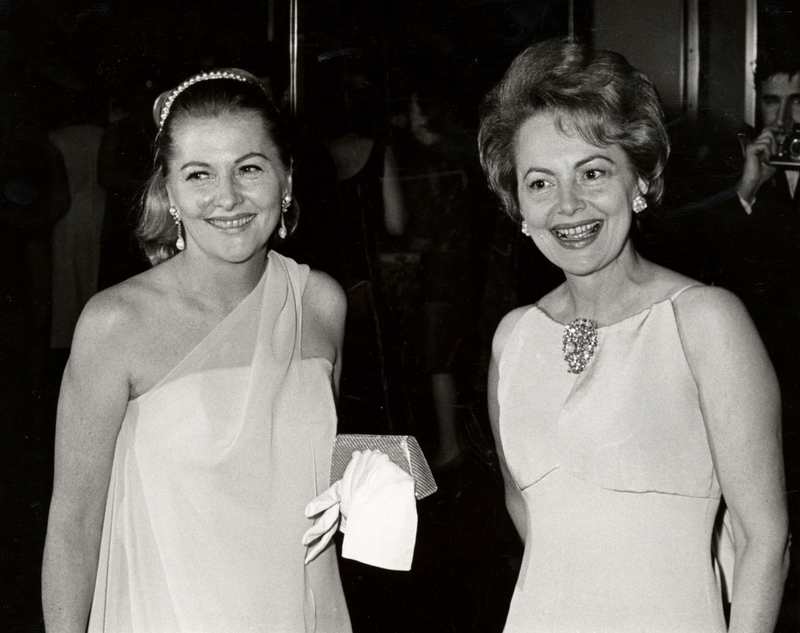 Joan Fontaine (left) with sister Olivia de Havilland at the 14th Academy Awards. 1942. 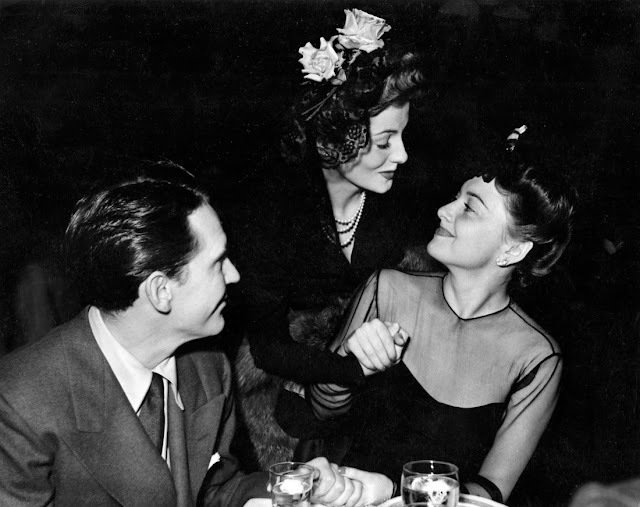 Joan Fontaine, with Burgess Meredith and sister Olivia de Havilland at the 14th Academy Awards. 1942. Joan Fontaine (left) with sister Olivia de Havilland at the 14th Academy Awards. Photo by Bob Beerman, colorization by Impact Digital. 1942. 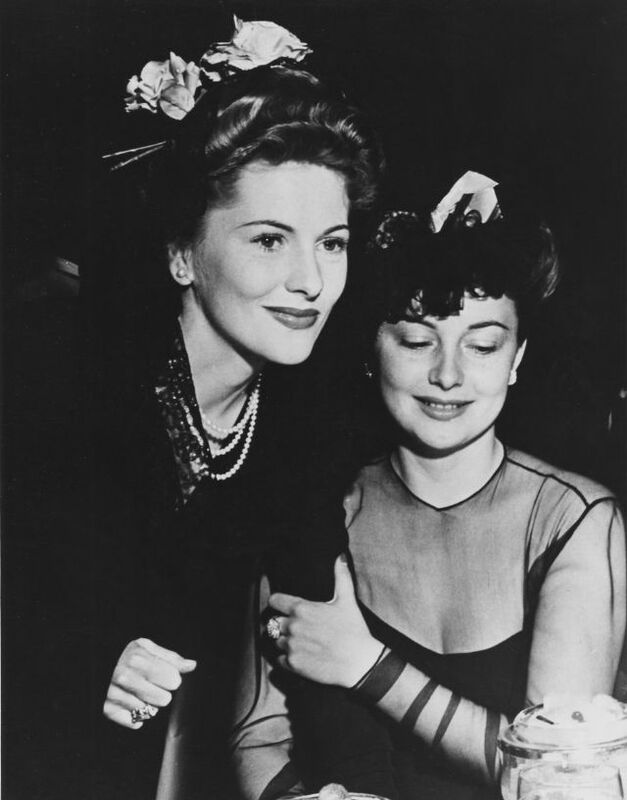 Joan Fontaine with sister Olivia de Havilland at the 14th Academy Awards. 1940s. 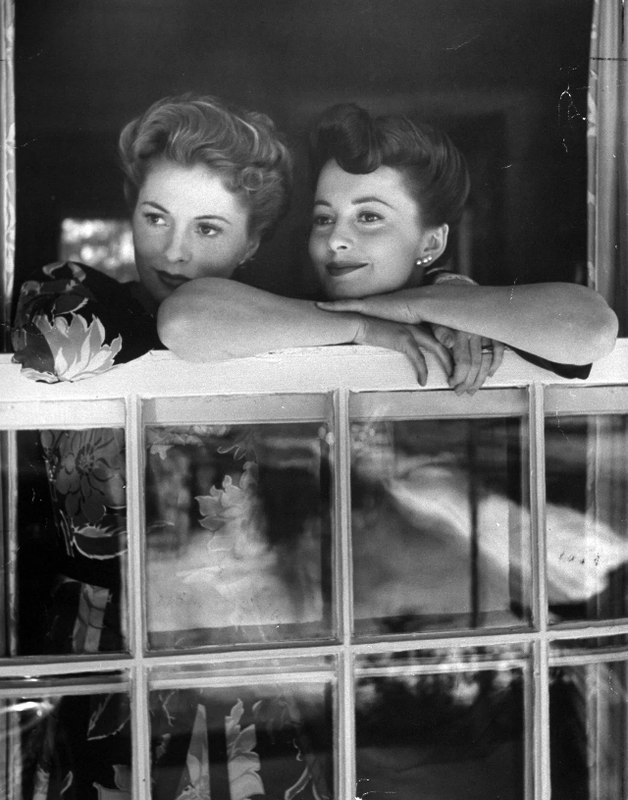 Joan Fontaine with her sister Olivia De Havilland looking out top of open window at her home. Photo by Bob Landry. 1940s. 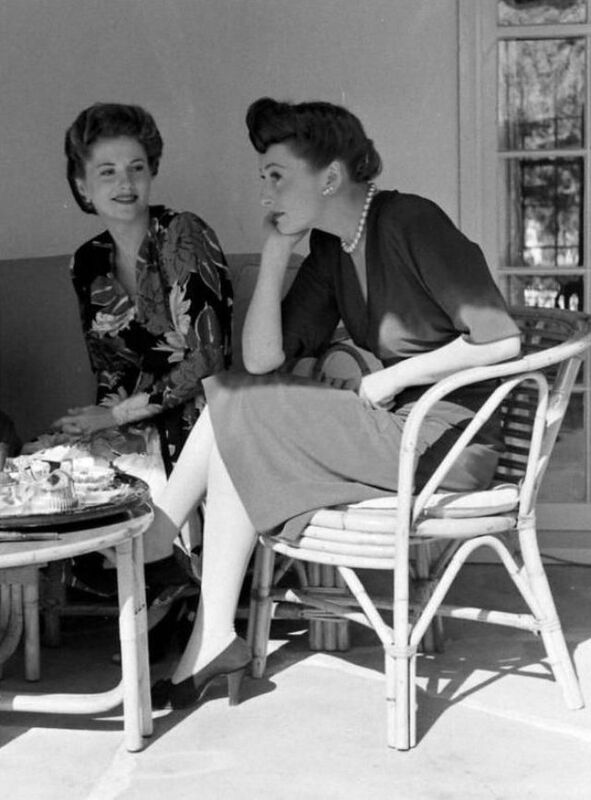 Joan Fontaine and Olivia de Havilland at Joan's Georgian home. Photo by Bob Landry. 1940s. 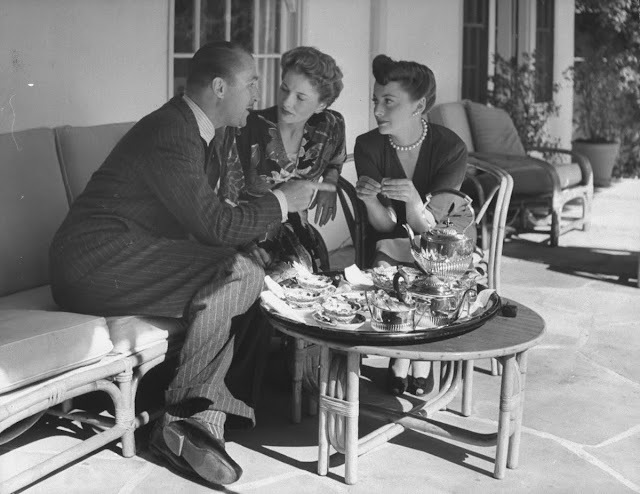 Joan Fontaine with husband Brian Aherne chatting with her sister Olivia de Havilland while having high tea on the patio of their Georgian home. Photo by Bob Landry. 1945. 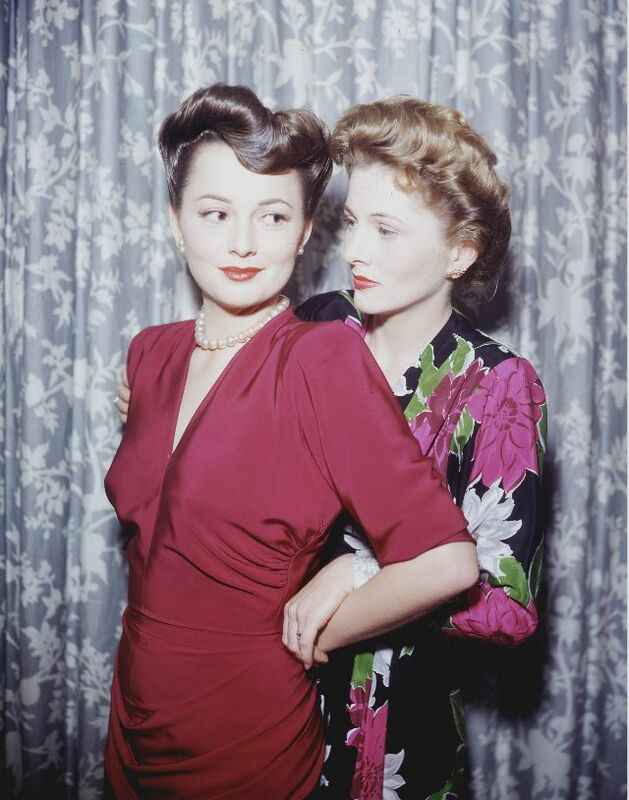 Sisters Joan Fontaine and Olivia de Havilland. 1945. 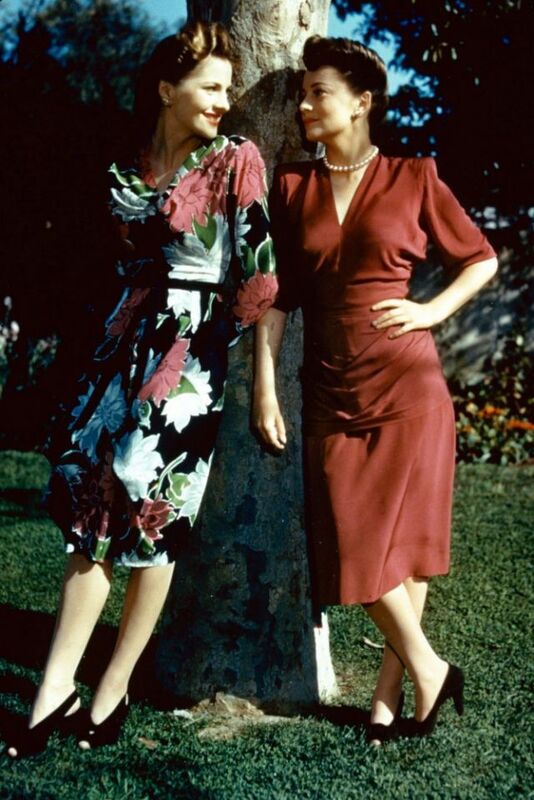 Joan Fontaine (left) and her sister, Olivia de Havilland, standing in conversation by a tree. 1945. 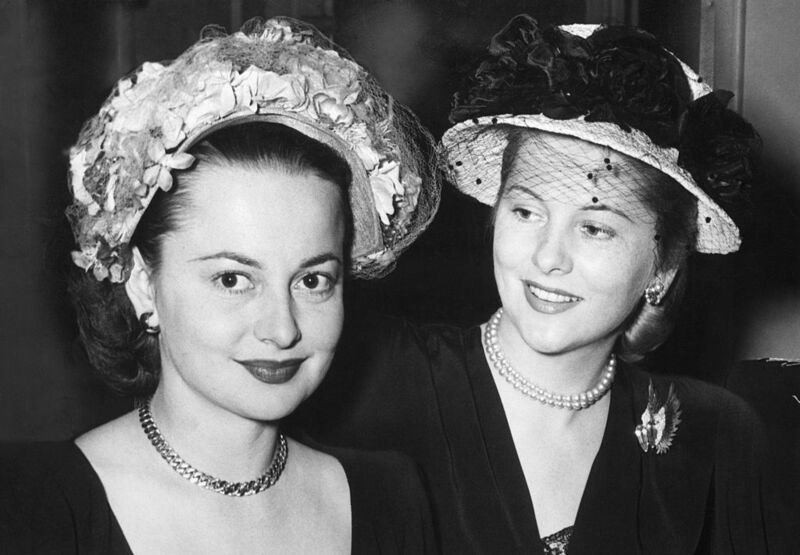 Olivia de Havilland (left) with her sister, Joan Fontaine. 1945. 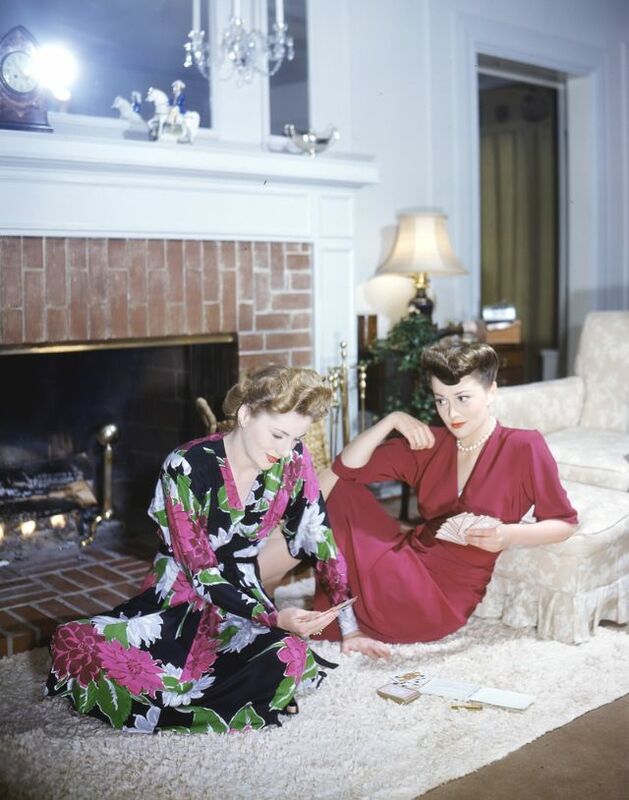 Olivia de Havilland (right) plays cards with her sister, Joan Fontaine. 1962. Joan Fontaine and Olivia de Havilland at a party at the Voisin restaurant in New York City. 1967, September 9. 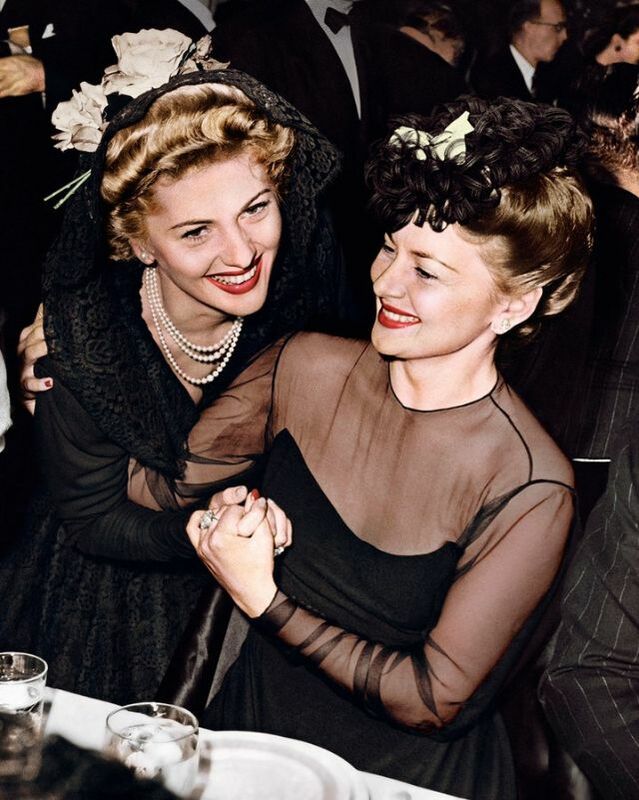 Joan Fontaine and sister Olivia de Havilland during Marlene Dietrich's Opening Party at Rainbow Room in New York City. Photo by Ron Galella. 1967, September 9. 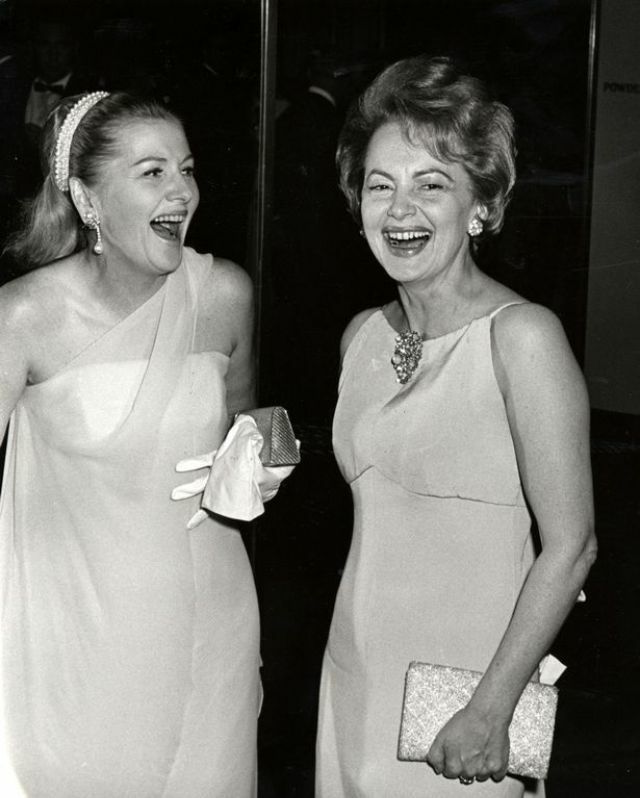 Joan Fontaine and sister Olivia de Havilland laughing during Marlene Dietrich's Opening Party at Rainbow Room in New York City. Photo by Ron Galella. 1967, September 9. 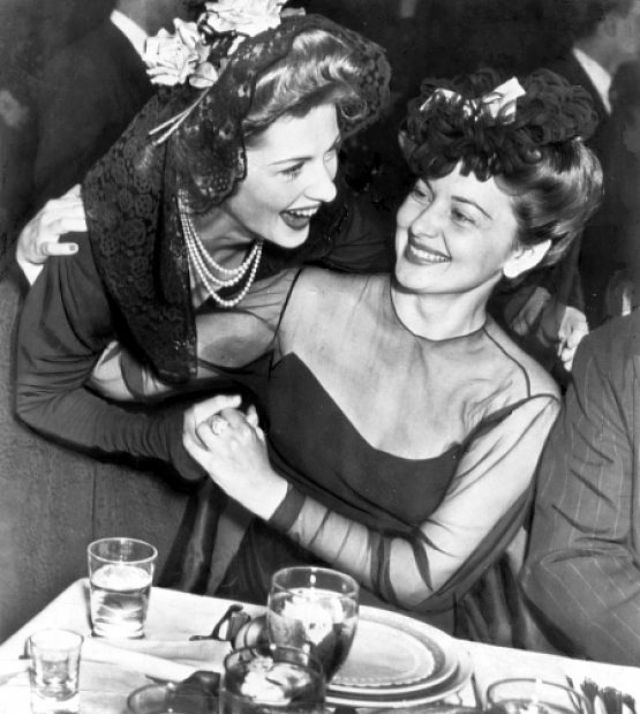 Joan Fontaine and sister Olivia de Havilland smiling to the press during Marlene Dietrich's Opening Party at Rainbow Room in New York City. Photo by Ron Galella. 1970s. 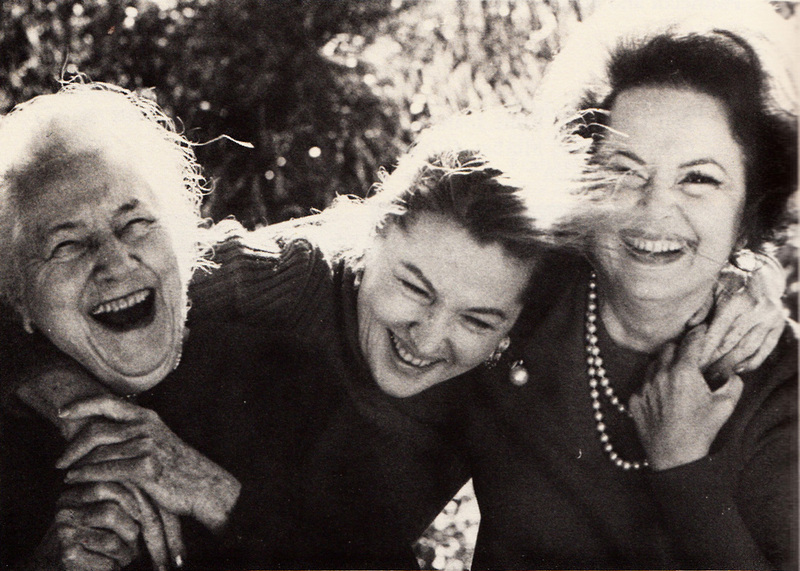 Lillian Fontaine and her daughters Joan Fontaine and Olivia de Havilland.